Exterior design alone reveals that the 2018 Volvo XC40 looks to new styling and funky looks for capturing wider buyer circles. The small XC40 Diesel SUV is comfortable to ride inside and has a very nice interior for travelling about town or out on an open road adventure. Diesel torque and diesel fuel efficiency will ensure that the turbo-diesel Volvo XC40 will be popular. The chunky exterior is bold and sporty. Head inside, and the neatly laid out cabin is well appointed and boasts comfortable, supportive seating. The middle seat at the rear might be a little tight for an adult frame; however any of the other XC40 seats offers plenty of room for taller frames. Boot space is good, particularly as the XC40’s boxy shape allows for easy access into the luggage space. Rear seats fold flat for loads more cargo space if the need arises. Throughout the cabin there are numerous storage compartments that will impress and come in handy. Cup holders and bottle holders are present. There are a range of models offered, so you’ll easily be able to find the right mix for your tastes. 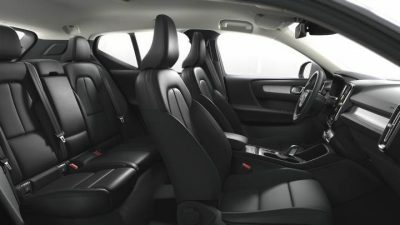 Base models have a premium cloth trim, while higher-end models get the full Scandinavian leather look. Soft plastics are used on many of the panels which have the look and feel of quality. 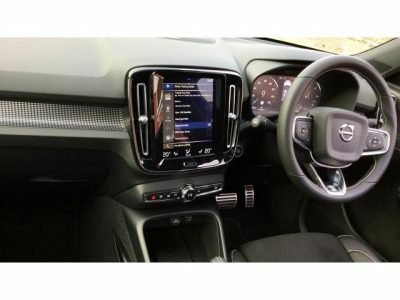 Even the base model Volvo XC40 Momentum has a beautiful, dynamic interior with an expensive looking trim – putting it right up there at the top of the small SUV luxury class. The Volvo XC40 Momentum models also provide owners with a special textile vinyl fabric for seating upholstery as well as classy Urban Grid Aluminium trim for a great look. Any of the models boasts Volvo’s nice 9-inch touchscreen infotainment system that has the function and feel of an Apple iPad. This system is found in the XC60 and XC90. You’ll note the trim and styling in the details for the Sportier-looking XC40 R-Design do give a racier appearance – which is nice. These R models get leather-nubuck upholstery, a leather-trimmed steering wheel and gear knob, as well as aluminium inlays. Volvo XC40 Inscription models are the most luxurious of the XC40 line-up. Full leather interiors with wooden trim are very nice and upmarket. A nice modern feature for the Volvo XC40 is the Smartphone connectivity. You have an app for your smartphone which allows you to programme the sat-nav inside the car from inside the warmth of your house or office. On that note, even the XC40 cabin temperature can be set, windows defrosted and remotely prepared by you from a distance on high-end models. This is a nice, glamorous feature. Wireless Smartphone charging is a pretty cool feature that is offered by Volvo and just goes to prove how modern and technologically advanced we seem to be getting. Volvo has always been good at providing their cars with great sound systems. 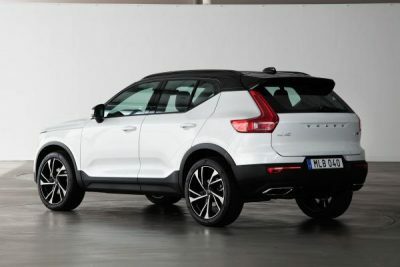 The latest Volvo XC40 is no exception, and the audio-visual package is a standard stereo that has a very healthy 250 W output put through 8 speakers. If you want the best in musical entertainment, then the Harman Kardon sound system is breathtakingly good with its 650 W output. Volvo’s XC40 Diesel models come with punchy performance and excellent fuel economy. They are not intended for track racing so don’t expect M-Sport performance and road holding, but they are taut and controlled with the emphasis being on comfort rather than sport. The Volvo XC40 will be available with a choice of two diesel engines: the D3 and D4. Manual and automatic gearboxes along with FWD and AWD options are available. For those who are after a sportier drive, you may want to look at the BMW X3 or Jaguar F-Pace alternatives. Volvo has equipped the XC40 with a damping control system that can select between Eco, Comfort, Off-road and Dynamic. The D4 is a 2.0-litre turbo-diesel with 140 kW and 400 Nm potential. One of the excellent features of the D4 is that it can easily return 4.5 litres/100 km on average. It never feels like its running short of power for everyday tasks, with a top speed said to be over 200 km/h. The 0-100 km/h dash can be completed in around 8 seconds with the 8-speed auto option. The entry-level Volvo XC40 Momentum Diesel will also be offered with the D3 motor, a 110 kW power plant linked to FWD. All other models will have the choice of the D3 or D4, or just the D4 engine. Again, the D3 is very efficient and remains nice and flexible throughout the engine revs. Using a mixture of cameras and sensors, the new Volvo XC40 Diesel will accelerate, brake and steer the car for you. All you need to do is set the cruise control speed and keep your hands on the steering wheel. The system can even steer the vehicle by itself through a long, sweeping corner. Pilot Assist, automatic emergency braking, blind-spot warning systems and rear collision mitigation ensures that you are in a Volvo – one of the safest vehicles on the road. Volvo’s XC40 Diesel models are impressive and distinctive. 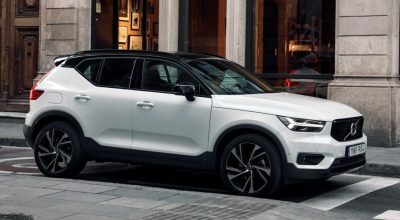 They have executed the smallest of the Volvo SUVs very well, making it slightly different in appearance and style than the larger XC models to attract more buyers into the Volvo fold. I reckon you’ll be rapt with this stylish new Volvo SUV.